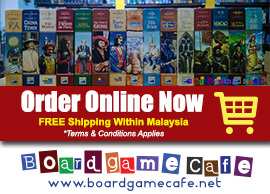 Not many may be aware there’s a series of Catan-theme boardgames beside the SETTLERS OF CATAN. CANDAMIR, THE FIRST SETTLERS is one of them and ELASUND, THE FIRST CITY is the other. 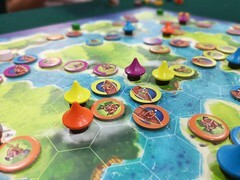 While both of these games continue with the Catan theme, they do not play nor look like Settlers of Catan and if you are a Catan fan but getting a bit bored with the Catan hexes and the various Kinghts, Traders and Seafarers expansion, you might want to check out these two Catan extensions. Therefore I was pleasantly surprised when the OTK crowd put ELASUND on the table last night. It’s all due to Hiew‘s instigation no doubt. Elasund plays 4 and in the game, you are working together to build the premier city of Catan. You buy building permits – sometimes forcefully “borrowing” permits from another player in order to build a larger buildings – and erect newer and better buildings to improve Elasund with the ultimate aim in building the Church. Above: The group laughing at another “7” roll! There are also the famous Catan pirate in this game. Roll a “7” and he makes an appearance. In this session, they were rolling “7” almost every two throw! Some of the buildings you get to erect in Elasund. The larger ones are more powerful and you can actually build a larger building “over” an opponent’s smaller building (taking out the smaller building as a result). Can be pretty cutthroat. If you are a fan of FFG’s ARKHAM HORROR series, you would have certainly heard of ELDRITCH HORROR which takes the Arkham theme on a global tour, literally speaking. Wolfx and group setting up the board for ELDRITCH HORROR. It’s clear Eldritch wins hands down on the setting up time compared with Arkham. Clearly the components in Eldritch is much lesser than Arkham. More streamlined perhaps. I thought they completed their game pretty quick – in spite of learning the rules of the game at the same time – and I heard they prevailed against Azathoth. Hopefully wolfx will share more of his thoughts on the game. This game is now available in our webstore. A group of APITT grads testing INFINITE CITY. This was a 2012 Essen game which we brought back direct from Essen and did not have retail copy for sale. It’s a tile building game from AEG. 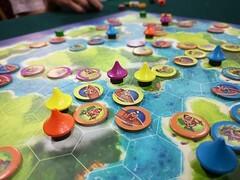 Details from Boardgamegeek in the link above. 7 WONDERS was on the table also. 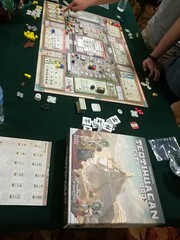 5-player session. Rhyen doing the rules. Rhyen’s Science strategy didn’t really got started… but he’s flushed with coins! Winner went to Lee Ching (on rhyen’s right) who built a couple of great Guild buildings to reap in the bonus points. Tonight looks like light-medium classic night. 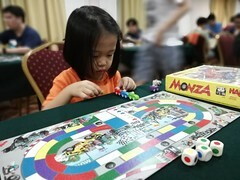 After Elasund & 7 Wonders, we now have Knizia’s RA on the table. RA session’s always noisy.. Coz you always push your luck when it comes to deciding when to bid. Ben (right) had one unbelievable run at the end of this session… after everyone’s out of Sun tiles to bid leaving him the only active player, he pulled a stretch of 8 tiles, all useful and all point-scoring in the last run. I think that batch alone scored 20+ points for him! 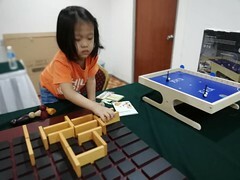 From Infinite City, the APITT group moved on to another fun fun noisy game PICK-A-DOG from Jolly Thinkers (based in HK). Pick-a-Dog and Pick-a-Pig are available from our webstore. Pick-a-Seal is their new release for 2014! While Stronghold Games has recently released an updated version of OUTPOST, about ten years back we already have a solid reimplmentation of Outpost via a low-profile game THE SCEPTER OF ZAVANDOR. First published by Lookout (in German) and later by Zman (German & English), SCEPTER was an implementation that married the mechanics of Outpost and in my opinion improved on it and mixed in a magic theme (of young magicians and enchantment of gemstones). For the curious, Scepter was designed by Jens Drögemüller who later became famous with TERRA MYSTICA. Terra Mystica just won the Golden Geek Award for Game of the Year 2013. One of our gripes with SCEPTER was the lengthy play time when we did it with 6 players. Tonite we went with a 4p session. Let’s see how it works timewise. In SCEPTER, you are a young mage working on your magic knowledge in order to become the top archmage. As a young mage, you already possess the ability to enchant opal (yellow) and sapphire (blue) gems (“enchant” is equivalent to layman talk of converting gemstones into magic dust which is the currency used in this game, whether to purchase more gemstones or to buy an artifact or sentinel). This is a game of magic powers and gemstones… so you get opal, sapphire, emerald, diamond and ruby. Hmm.. If this game is to be pimped with acrylic gems? You only start with the natural ability to enchant opal and sapphire. To be able to enchant the higher value gemstones (emerald, diamond and ruby), you’ll need to improve on your magic knowledge eg acquiring the spellbook (artifact) in order to enchant emeralds and the elixir (artifact) to do diamonds. Enchanting gems allow you to convert them into magic dust (above), which is the currency used in the game; to buy more gemstones, artifacts or sentinels or to improve your magic knowledge. The “tech tree” of this game – much improved from Outpost – where you can plan the game to your starting character’s ability or to further customize the game to your advantage. For eg the Druid has the advantage of being able to enchant ruby at an earlier level than the others which likely influence the Druid player to go for the Rubies strategy. These Knowledge areas combined with the artifacts you acquired are the engine for this game. Besides providing customized abilities for your character as you advance the levels of each knowledge area, reaching the zenith ie the 4th level (eg yellow above) also scores you 2 VP. There’s a total of a good 12 VPs available from the 6 knowledge trees. My character (red) was the Witch and given she starts with the Knowledge of Gems (lower pricing for purchase of gemstones), I wanted to focus on building up higher value gemstones but alas was slow to get into emerald when the Spellbook artifact was snapped up by Dith! So I ended up with a sapphire income engine until I managed to acquire the Elixir artifact later to switch to diamonds. Dith’s character (green) was the Fairy and she has the knowledge of the 9 Sages, which provides good income infusion with 2 extra gem cards (increasingly expensive from Sapphire to Emerald, Diamonds and even Rubies) as he advance that knowledge tree. He outbidded me for the Spellbook which enabled him to be the first to enchant Emerald but I think he got in too early with emeralds and did not have the proper income engine to support the more expensive cost of acquiring more emerald gems. Ivan’s character (yellow) was the hermit (?) and he started with the Knowledge of Accumulation which enables him to have a larger active gem pool (players start with 5 and this knowledge tree allows you to get an additional 2). He went quickly for a large stash of sapphire and when he acquired the Elixir artifact, started upgrading the sapphires to diamonds for a much improved income engine. 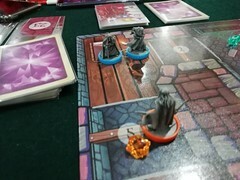 Rhyen’s character (blue) was the Druid and with his knowledge of fire, he’ll definitely be going for the Rubies strategy since he’ll be able to learn how to enchant ruby earlier than the rest of us. And Ruby being the most expensive of all the gemstones, this is a strong strategy to pursue. But once you get your Ruby engine sorted out, it gets you the highest income (60 magic dust per concentrated set of four rubies). You might think if that’s the case, just go with Rubies strategy FTW? Nah.. due to it’s slower build-up, the rubies strategy can be countered by a faster rush of the artifacts from the other players. The upside is a Rubies fella always finishes the game strongly. Dith getting his emerald engine purring.. but I think the early setback dragged him behind. In our session, most of us maxed out on 2-3 knowledge trees (of the max 6 available). And best of all, the game completed in around 2ish hour. That’s a great improvement over the past sessions where we did 6 players and one session took longer than 4 hrs and another didn’t even complete. I now believe this game’s best with 4 players. This is one of my fave classic so was glad we took it out for a session last night. I haven’t played the new version of OUTPOST so would be looking forward to try that and see if they’ve improved on the game with the Stronghold edition. SCEPTER is long OOP (out of print) but there’s a recent game MINES OF ZAVANDOR which is a lighter game that borrows from the mechanic of SCEPTER. Worth checking this out too.